PDQ Deploy allows you to define deployment parameters on a global, manual (Deploy Once), schedule, package, or step level. Deployment settings defined at the step level allow you to manage how individual steps within a package are deployed. Step settings apply to all deployments of the package and they override all other deployment settings defined in Preferences as well as those defined at the Schedule or Package level. Conditions are not deployment settings, however, all conditions must be met on the target computer for the step to run. If the step can’t run due to conditions, then it is skipped and the next step runs. If no steps can run in a package for a particular target, then the deployment fails and returns an error message stating “Conditions not met: No steps were able to run”. See Common Step Properties for more details on the Conditions tab. 3.Select the step you want to configure. IMPORTANT: For Auto Download packages, the predefined steps of the package cannot be edited. However, you can add Pre and Post steps to the package. See Editing and Adding Steps for more details. Enterprise mode required for Auto Download packages. 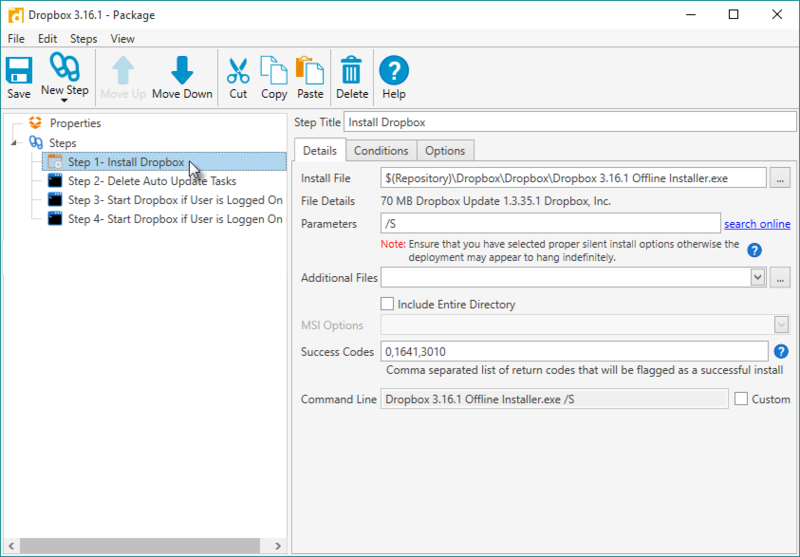 5.Define the Deployment settings you want to apply to the current step within the package, then click Save on the toolbar. If this option is not selected, the step is skipped during the installation. This feature enables administrators to “turn off” steps that they may want to enable in the future without deleting the step itself. If a step is disabled, the name of the step is struck-through. Steps can also be enabled or disabled by right-clicking the step and toggling from Disabled to Enabled. Select an option to determine what account the step uses when running on the target machine. NOTE: This option only applies to Install, Command, File Copy, and Message steps. Deploy User is the recommended setting and should be used unless there is an explicit requirement to use another method. For detailed information about Run As settings, see Run As in Deployments Preferences. The default Run Package As setting defined in Preferences. This setting is most appropriately used for individual deployments that require user input, but the overall process still requires Administrator rights that logged on users may not have. Because these types of deployments are more specialized and because running the deployment in interactive mode requires more processing resources, it is recommended that you apply this setting only as needed at the Step level. This setting is used only for installations that require Local System. These types of deployments are very rare. Consequently, it is recommended that you apply this setting only as needed at the Step level. IMPORTANT: Steps that run as Local System are not able to access network resources. This setting is used to deploy applications that are installed per user or when the Logged on User needs to provide information for the deployment to succeed such as a license key. It can also be used to modify the HKEY_CURRENT_USER registry hive for the Logged on User or to access user-specific settings such as %APPDATA% or the Logged on User’s user directory. These types of deployments are highly specialized. Consequently, it is recommended that you apply this setting only as needed at the Step level. Select an option to determine how the deployment responds if a step fails. If the step fails, stop deployment with returned error. Continue deployment even if the step fails. If the step fails, stop deployment and report success. NOTE: Success Codes are defined at the Package level. They are the numerical value for Windows system error codes. The default success codes are 0 (action completed successfully), 1641 (reboot initiated), and 3010 (reboot required).